Now the cooperation with PIRATE and consequently with EXECfintech and EXECinsurtech is in his second year. Together with our friends from Cologne, we have also continuously improved talque, especially in the area of technology-driven start-up events. Our new 1on1 meetings 🤝 were already used at the beginning of the year at TechChill 2019. As a result, we have further improved the feature, eliminated minor usability weaknesses and expanded the meeting spectrum. In addition to the 1on1 meetings for all participants, at which talque meetings can be arranged and assigned to certain meeting spots, companies can now book exclusive meeting tables and meeting slots for startups and other participants to apply for. Within talque, the company can then obtain information about the applicant (on the personal profile or the startup's profile page) and decide with whom to arrange meetings. So the question is no longer "Matchmaking or Networking? - both is possible. And this also on April 10, 2019 at the EXECfintech, which is connecting Europe's movers & shakers of the Fintech scene with each other. Since 2014 EXECfintech has established itself as a leading Fintech conference in Europe with a focus on early-stage startups in the financial technology & innovation space. Gathering the industry’s movers and shakers from startups, financial institutions and investors, the main purpose is to create a platform for meaningful exchange. talque can direct meetings to specific spots according to the wishes and specifications of the organizer or ensure a balanced distribution of the meetings. This guarantees that participants find suitable places for meetings, that there are no double bookings for only one meeting table, and that certain meeting rooms are not overcrowded or too empty. For example, if an organizer wants to make a meeting lounge available and always have it filled, he can give high priority to this meeting spot and determine in advance how many meetings can take place there. Priorities, capacities and limits are always variable and can be adjusted live, even during the event. And it is very easy for the participant to use. 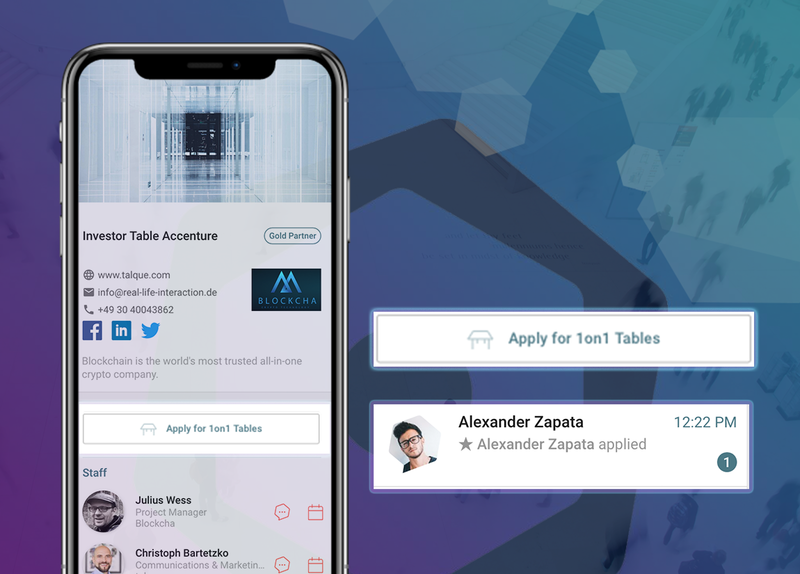 If you want to apply for a meeting at a table host, just go to the tab of exclusive meetings and click on the company profile you want to apply for. The personal host can then choose which applicant for a meeting fits and confirm an appointment. The meeting is then automatically booked on the exclusive meeting spot. 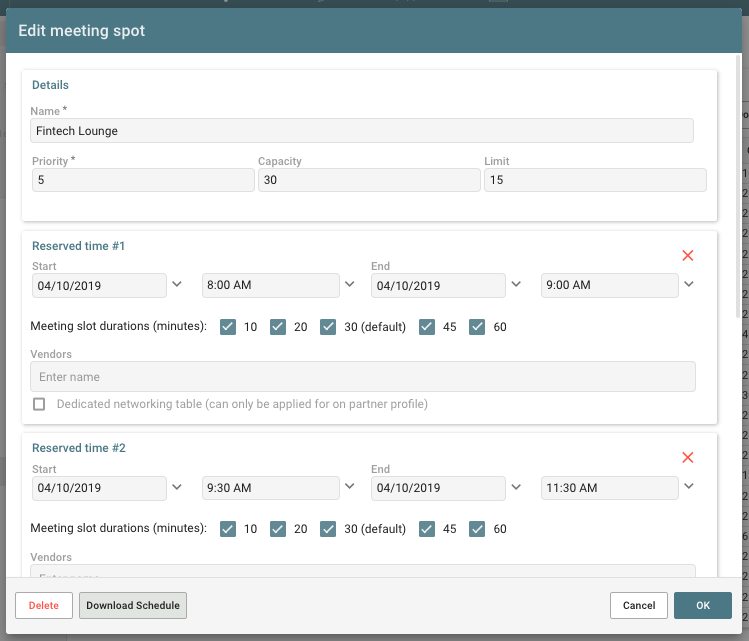 For the normal meetings for all participants you can simply tab or click on "Meet" in the participant profile, select and suggest timeslots, add a short message and send it. The invited person can then select and confirm the desired time slot for the meeting or send a counterproposal. Once the meeting is fixed, all that remains is to wish it every success. Happy Meeting! If you want to know more about this feature or the event app / web app, just contact us. If you have any further questions, please have a look at our FAQs or contact our support directly in the App.